Have I discovered where Sapience got 10% from??? Thread: Have I discovered where Sapience got 10% from??? The line that caught my eye was where the author quoted someone from Blizzard saying that with Wrath of the Lich King, only 10% of their player base was completing the raid (sic). As this seems very similar to that which Sapience has said in the past, I can't help but wonder if that is where the initial seed of the "only 10% raid" came from. I was Bhorn, bhorn to be wild... dum-de-dum-de-dum. No and they aren't going to explain it to us. Looking at what they were trying to justify working on at the time (revamp old areas, make stuff easier for casual players, and turn end game into something that scales from lvl 10), I would say it's safe to just forget that number. It was most likely a stat that states only 10% of accounts even do end game activities. Most accounts in any MMO never play for more than 50 hours total. Most accounts haven't reached level 50 in LotRO. The very large majority quit playing before they even have a chance to run end game raids. Your percentage of players who like running end game instances is much higher if you just look at accounts who have played hundreds of hours, been with the game for years, and actually got characters to end game. They were catering to those who aren't long time players and who haven't stuck with the game. They wanted new players and didn't want to invest what it took to create the end game that they had always provided before. This is just business and long time players clearly aren't where the money is. The article is nothing but conjecture. And "raider" still isn't defined. Until that is, it's just garbage from a site full of it. Raids cost money to produce; a lot more than normal questing content. Most of that cost is taken up by the testing/balancing process. They have to pay 12 people to ascertain whether a raid is challenging, whether it's balanced, etc. Turbine just didn't want to pay for that building/testing process anymore. Raids cost money to produce; a lot more than normal questing content. How much did the Rift cost? The number of hours a player plays, the length of time they have been playing the game and the number of characters at max has zero to do with raiding activity. Lol. It has everything to do with it. If they claim that "less than 10% of players raid", yet they're even counting "players" that did nothing more than download the game, make a character, run through the tutorial and then permanently uninstall the game, then they're not basing that >10% figure off of an objective snapshot of the game's real playerbase. Regardless of where they're deriving that figure from, those >10% account for a very important, cohesive backbone for each and every MMO community. The "raiders" are the most social, most heavily invested players in a given MMO. You'll notice that virtually every other major MMO still regularly produces raid-type content, yet for some reason, LotRO can't or won't. What he said was it's less than 10% (or was it 9%?) so you should be using <10% not >10% (greater than 10%). I seem to remember that he also considered anyone doing group instances was what he considered a raider so that even skews the numbers. Basically anything that came out of his mouth was pretty unbelievable. Mouth of Sauron and all. No one but Turbine knows. They are not going to tell us. Turbine had a much larger Lotro team back when the Rift and Helegrod were done. One of the biggest problem with a Raid like the Rift is the need for a large testing organization. It is a 12 character instance. You need 12 humans to run a test. Each hour of testing is 12 staff hours. You have to shake loose 12 people at the same time to test a Raid instance. You design a 24 character instance you need 24 people. One way to get around the number of testers is to have the customers test it on something like Palantir. Sapience didn't say that 10% of players were raiders. 1. PvMPers and Raiders combined do not make 10% of the total player base, and never have. 2. Of the two, PvMPers are a "far larger" group than Raiders. 3. Forum posters make up a slightly larger group than the combined PvMPers and Raiders. 4. Of the group of forum posters, PvMPer and Raiders make up more than half (with PvMPers being the majority of those). Based on the above, it is easy to calculate that Raiders make up less than 5% of the player base. This is in general agreement with the 10% WoW number as reported in the article. I would expect WoW to have more raiders, of course. But from Sapience's statement, it is clear he didn't use the WoW number as the source of his data. As has been discussed at length already, how you define "Raider" determines this percentage, of course. I believe the definition here involves players that participate in some form of raid (i.e., multiple-group) instance on a repeated, regular basis (say, at least 2 or 3 days a week). That leaves out what I would call the casual or occasional raider (like me). Definitions are important, which is why I am dumbfounded by raider proponents who don't consider those who do tier 1 or "faceroll" raids to be "real" raiders. The more you narrow the definition of raider, the smaller you make the group, and the easier it is to justify not spending the resources on making new raids. The key to justifying future raids is to be more inclusive in our definition of "raider" so that the percentage of the player base that would arguably consume the new raid content is larger. Yeah, man, but you can't have 'the bads' expecting to get the same consideration. Killing a Boogan somm'ers, 'cause they remind me of Bogarts. That's pretty misleading because 12-man skirmishes are definitely an end-game activity. 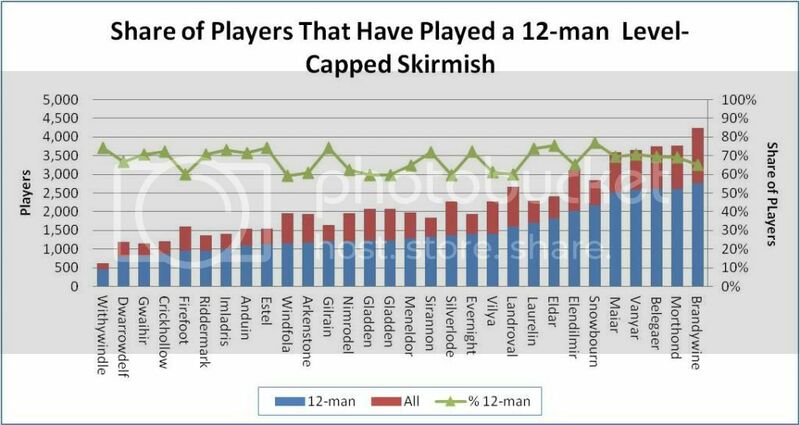 If you look at the share of level-capped characters that have done 12-man skirmishes you get about 68%. Now, I don't think of a 12-man skirmish as "raiding" per se, but it definitely requires a lot more group coordination than most activities. The fact that over 2/3rds of the population plays them suggests there is a lot more interest in such activities than purported. That is a very nice chart. You have some skill. I know because I could be MOUS Certified if I wanted to spend the money. There was a reason I asked for the source. So lets look at the source data. We'll take Windfola as a sample. (because I play there) All the following numbers are approximate. 8,140 toons have tried skirmishes(?) at some point. The '?' is because mylotro is not detailed enough to see if only skirmishes are showing, but we'll assume so. 1,940 are at level 85. I would have use the first number, but we'll go with only level caps since that's what you decided. 1140 / 1940 59% have entered a 12 person. You assert that ALL 1140 play 12 person skirmishes. I'd not go that far, as at least 60/1940 3% have not completed one or earned SM. 600 / 1940 31% have done 5 or more. Still not sure I'd qualify them as 'Play'. 500 / 1940 26% have done 10+. I'd say they qualify as 'Play'. But I would not group them in as Raiders. 250 / 1940 13% have done 20+. Getting closer to what I'd call Raiders, and closer to my 10%. A very few have done around 80+, maxing out at about 110. Overall I'll admit the numbers are higher than I expected. With what looks like as much as 26-31% willing to run them a minimum number of time to get the rewards. But I'd still say less than 10% want to run that content by choice. It would be even less now, as 90% of the Raiders have left the game. D'oh! That's what I meant to use. Is my face red, or what? Please explain. What are the "bads," and what do you mean by "consideration"? Please explain. What are the "bads,"
The physical DPS classes you see with Will and Power Essences all over their armour and a Resolute cloak. The characters you see with all the best legacies missing from their LIs and the worst possible choice of relics. You know the "bads".....they are everywhere. Well first are those 10% from all characters ever created or characters at level cap? Even if it was true, there is no excuse for making zero challanging, rewarding, group-oriented endgame. What is the point of giving everyone the best possible loot in low to no effort content. Its like telling why bother studing in the University, you will get your degree after Highschool. Not every one must have a degree if they wanted one, they should work hard for it and only some will succeed at the end. Stop me if I go to far, this behaviour suits communistic ideology where everyone has the right to be the same which leads to no overall improvement because why bother with the difficulty when we all get rewarded in the same way. I quoted Sapience in order to clarify that he did not say that 10% of players were raiders. In effect, the conclusion to be drawn from his post is that fewer than 5% of the total player base are raiders. As we both know, understanding that statement requires knowing how "total player base" and "raider" are defined. Further, this tells us nothing about the economics of the situation. As PM said before he was laid off, F2P economics are not straightforward. We know that raiders are disproportionately represented among forum posters, as are PvMPers. (I don't think anyone will dispute that PvMPers and Raiders include some of the more passionate and invested players in any MMORPG.) How are they reflected in the economics? What percentage of revenue do they generate? Are they more likely to be subscribers? Are they more likely to spend money in the Store? Then throw in the costs of making raid (multi-group) content, as mentioned above. This is a particular concern, given the limited resource situation and age of the game. Sapience - The broader answer is that when they say raids they mean group instances. Okay so I absolutely agree with every poster who has ever said this is entirely based on how you "define" the word Raider. As Castorix is quoted above saying that the group is certainly over 50% and I'm sure that is true, probably very close to 100%, but that is likely not relevant to this discussion. It has always been my opinion that this topic is manipulated by Turbine because they do not have a way to accurately measure and assess a game players true intention. I will make a broad example here to illustrate it, but if a new region is released and a player spends 20 hours completing the area, maybe another 20 hours doing deeds to get rep, maybe another 10 hours doing various quests and such to prepare his toon for the ability to maximize his armor, he now sitting at 50 hours of play time and he has done ZERO raiding. Anyone watching his activity would say this player is not a raider and they would have factual data to back it up. But for this player, his entire preparation time has been spent getting ready for end-game activities. It has always been my opinion that back when Turbine made the decision to stop releasing Raid level content, the first time they did this they should have offered an opt-in Raid for separate purchase to the community. They might have taken a financial beating on that one raid (maybe) but they could have used that as their buffer to say to the community, "Look, we offered you a Raid and you had the opportunity to vote with your wallet if that was something you wanted but we (Turbine) did not re-coop our expenses on this raid, so we can not continue to offer them to you in the future." Something like that would have at least been a solid argument that could have created a defined expectation and resultant. As it is now, it is all merely conjecture and I think that is the largest disconnect we have in this game and has caused the loss of many good bill-paying players. I'll be here until we get to Mordor (fingers crossed) but I think this could have been a better experience and I am not by any definition considered a raider. I don't even consider myself a raider, although I do like to play them occasionally and would have forked out extra dough for a stand-alone Raid if it was high quality. Raiding is defined by the group and the challenge... which is nowhere to be found in t1 and skirmish raids. Even labelling those as 'casual raiding' it's a gross exageration. By broadening the definition of raiding that much we would include most of the actual community under the raiders label (since from my experience most players experience group content in some way) at the expense of the very core essence of raiding. Yes, your post is an example of the reasoning that I am dumbfounded by. First, by excluding T1 raid instances and all skirmish (and I assume BB) raid instances (in essence, anything other than T2 or above multiple-group "classic" raid instances), you are defining "Raider" so narrowly that you're talking about a miniscule percentage of the player base (no matter how you define player base). Your definition of "Raider" is narrower than Sapience's. Why would any business spend significant resources at this point for content aimed at 1% to 2% of the population? Easy answer...they wouldn't. Second, this approach leads to the exclusionary and "raiding is superior" tone that drives away possible supporters for adding raiding content, and antagonizes a substantial number of players who don't meet your exclusive definition. Why feed the anti-raider flames? If you don't want non-Raiders supporting adding raiding content, at a minimum you don't want them actively opposing it. As it is now, it is all merely conjecture and I think that is the largest disconnect we have in this game and has caused the loss of many good bill-paying players. The above is the most intelligent and well thought out statement ever made on this topic. Build a raid, offer it as a TP purchase and see who buys it. If nobody does THEN they can be justified in making no more. Simples! Don't offer any new raids for a year. or years... and of course the numbers would say fewer people have been raiding in a measured time frame. Lies, damned lies, and then there's statistics. If LOTRO brought out a new raid, old kinships would re-ignite, some of the fan-based sites may find new benefactors, reviewers on independent websites / youtube reviewers would have something to talk about... it's not rocket science this stuff. In fact you could probably find some convincing statistics to back it up, he joked. Lets do this in the fashion of the Current Internet craze -- Kickstarter. 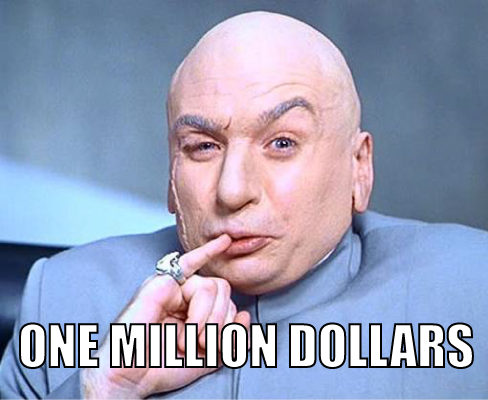 I propose to "build a raid" -- Lets see how many dollars we are going to need to create that raid. I'm going to ignore A LOT of the infrastructure needed to design build and test this and work directly with the Developers. * First question -- How many developers shall we hire? * Question number two -- How much do 10 developers cost for 1 year? What is the prevailing wage structure for "competent," "experienced" and "lead" developers; same for the "artists" to do the "pretty landscape and "awesome armour." I've named 5 categories, so lest hire two of each. Normal HR types say, plan on spending 25% of base salary on benefits; but we'll simply screw our Designers and not pay them any benefits (and since we are only working with 10 employees, we don't have to worry about the Affordable Care Act mandates. Now for the infrastructure we are ignoring -- we will assume that like a carpenter in the construction industry, these designers are all expected to bring their own tools -- Computers, Storage and Software. If that is not acceptable, and if we are going to worry about the fact that some of these folks will be working with a Samsung Magic wand on their smart phone, some with a Windows XP system and the Artists with Macs.... then we will have to budget some amount of money, say $5-10K each to buy them decent professional grade hardware -- another $50-100K. And then there is how we are going to get all of those devices to talk to each other -- network hardware; and common storage. You get the idea. Then we need to figure out how we can get more than 2 or 3 people able to access the final product at one time. Your cheep DSL line definitely won't cut it; "Boost" from Comcast is a joke; so that leaves paying real money for a real High-Speed Internet pipe that will allow multiple people access to the product. So, I'm guessing that we could create a Kickstarter project for $300-$400K that would get us a single Raid in a years time. How many people will sign up for it, send in their money, and be willing to wait that long with nothing to show for it until then? Will they buy Monthly Subscriptions -- Lifetime Subscriptions - or will they expect to be able to play for free? Do you really think a company like Warner Brothers or Turbine or Blizzard can do it more cheaply? The "Cost of one Raid Tier" is a very real thing. It's probably a simple statistic. Press CTRL + K in game and you get a HUGE amount of stats of all the instances you completed, including number of kills, number of boss kills, successful completions, failed completions, etc, etc.... It goes as far as statistics of average marks per hour, quickest completion, etc, etc. Seeing they can collect all that info and store it in a database, they are very likely able to collect a whole slew of data we can't see on the forefront. It's probably very easy to do a query on how many level-cap players have logged on over the last three months, and how many of those have started and completed a raid, collect it all into a nice powerpoint presentation for internal use, and discuss what to do next in lotro under the enjoyment of donuts and coffee. They can probably pull a huge amount of statistics from their databases, show patterns of which raids are ran most, which the least, whether they are T1, T2, etc, and they can most likely even pull statistics on how often a first age symbol drops, and whether the percentage chance needs to be adjusted. Sapience had, and current Turbine employees have access to those kinds of database queries. It be very easy for an employee to make the 10% claim, as they are on top of all the statistics they need to make that claim.